That good talents make an organisation sounds like a tired truism, and in the philanthropy and social sector too organisations are cognisant that they need to assemble a team of professionals with expertise and interest so as to implement and fulfil their philanthropic aspirations. Yet there appears to be a mismatch: Potential candidates (or “the supply”) are reporting challenges in the recruitment, integration, and retention phases, while the philanthropic organisations (or “the demand”) have had difficulties identifying these talents at the senior level. What has emerged as critical to bridge this talent gap – after a research study conducted by Asia Philanthropy Circle (APC), based on 20 high-level interviews with a mix of potential candidates and philanthropic organisations who represent the five South East Asian countries of Indonesia, Malaysia, the Philippines, Singapore, and Thailand – is the need to define an industry standard on what a good candidate for an executive management position in a philanthropic organisation looks like. With a focus on the executive directors (ED) and the chief executive officers (CEO) of these organisations, perspectives on both the problems and the corresponding recommendations are highlighted. Some of these problems may not be surprising, but this study is one of the first concerted efforts in the region to systematically research and document findings, so as to generate impetus for collective action. Pay and compensation, as well as the availability of career development pathways for mid- to senior-level candidates, emerged as the key considerations for potential candidates. Overall the respondents also pointed to limited recruiting scope and board governance as issues, though the finding that recruiters often disregarded the non-profit experience of potential candidates might be interesting for some. 10 recommendations are proposed in response, and APC is committed to take the lead by crafting a “competency framework” with fellow industry stakeholders that will help set a benchmark for reference, and by catalysing an exchange or fellowship programme. Some of other eight recommendations can be adopted by organisations internally and put to effect expeditiously – such as “transition programmes” for potential candidates making a jump from other sectors, the adoption of valuable approaches such as benchmarking HR practices with the SME sector, as well as strengthening the development of senior management – though others require sector-wide reforms and mind-set changes. Among these industry-wide recommendations include the sharing of case studies or “good-in-class” HR practices, the creation of a South East Asian database of executive pay and compensation, as well as advocacy for board improvements. The work involved in the individual and collective implementation of each recommendation is substantial, yet necessary. “Bridging the talent gap”, in other words, is but the first research brick that APC is laying for the philanthropy and social sector in South East Asia. With this first step, APC – informed by the interests of its members – is committed to mobilise the contributions of relevant and valued partners, to effectively create a sustained momentum to advance the level of professionalism in the sector so as to grow social impact in the region. Far too often, philanthropists and non-profit professionals in the region run ahead of their capacity to implement and fulfil their philanthropic aspirations, and in the process pay too little attention to the overall talent deficits in the sector. A long-term goal, in this vein, is to actualise the vision – or truism – of empowering potential candidates and philanthropic organisations in the philanthropy and social sector to be matched more effectively, first and foremost by defining an industry standard on what a good ED or CEO looked like, and in addition, what a good organisation looked like. This will take time and effort, though the investment will be well worth it. 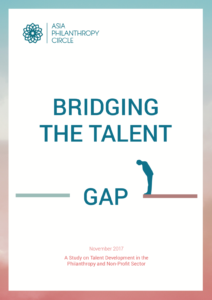 *Jinyao is the researcher and author for the report: Bridging the Talent Gap, which will be launched soon with members and industry leaders.